Moo Yong is strange stuff. The closest description I can offer is that it is “sweet pork fluff”. It’s kind of like a combination of pork scratching and candy floss. I openly admit and am quite aware that this isn’t an altogether attractive mental image but somehow it just works and I find it rather addictive. I’ve never found it yet in the UK but would love to hear if anyone has seen it! It is known as “rousong” in China and is made by stewing pork in a sweet soy sauce. 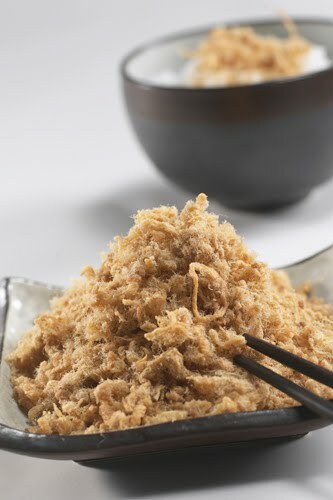 Once cooked to the point where strands of pork can be teased apart as finely as possible, the mixture is dried and hey presto, pork floss! I don't know if this is convenient for you, but Vinh Phat on Southwark Park Road in Bermondsey has it.